It got me to wonder a little on what does it takes for an eatery to survive and actually lasted for 10 years in Singapore? Not many of these eateries around and some only lasted for just a couple of months before closing down. Their reasons for not been able to make it are quite identical, it is mainly due to the manpower issues as well as of the high rental. So, what exactly does it takes for a eatery to go through that and is still around after a good 10 years? 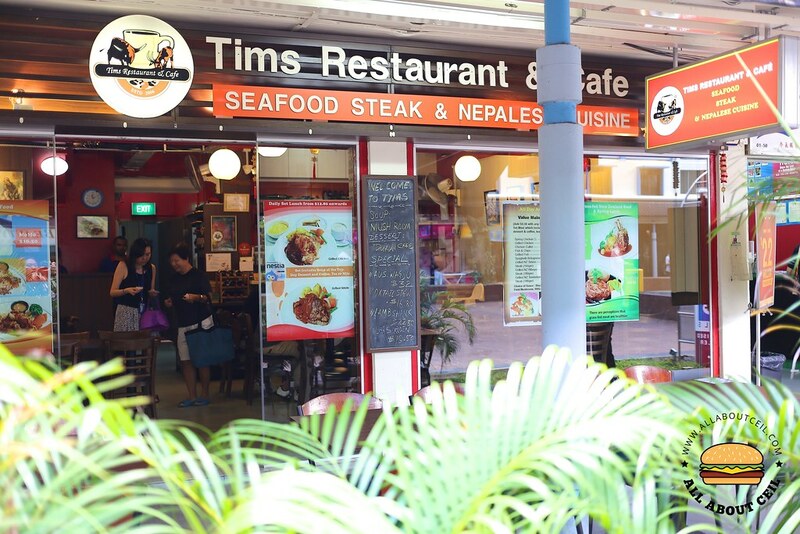 Tims Restaurant & Cafe is amongst those that have been around for at least a decade or longer. 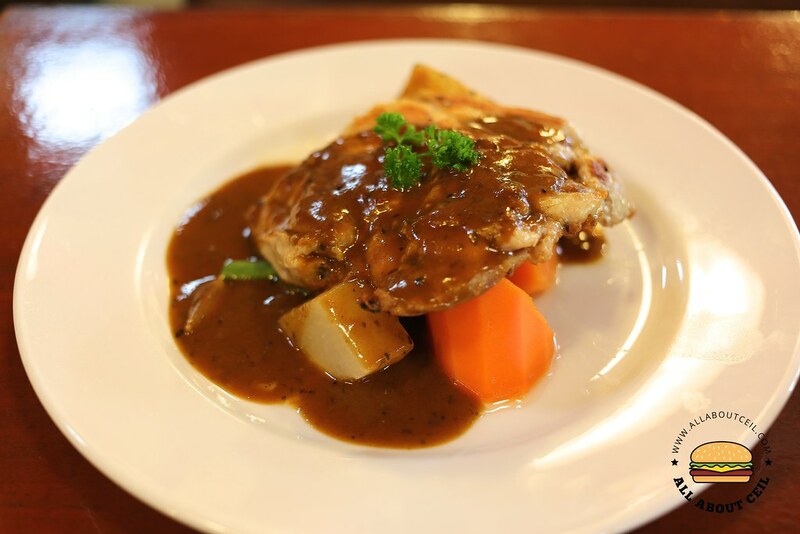 It is located in a shop house nestled underneath a HDB block next to the food centre at Toa Payoh Lorong 4. Their menu includes Western & Nepalese Cuisine like Himalayan/Nepalese dishes, Hot Dogs, Burgers, Pizza, Seafood, Steaks and Vegetarian dishes. Tom Shrestha, the owner, is from Nepal, he started this since 2006 and is currently celebrating the10th year anniversary of its existence. They do serve set lunches from 11.30 am to 3.00 pm. There are Grilled Chicken Set ($12.80), Chicken Cutlet Set ($12.80), Grilled Fish Set ($12.80), Fish & Chips Set ($12.80), Vegetarian Spaghetti Set ($12.50), Fried Chicken with Onion Rings Set ($13.50), Fried Fish with Calamari Rings Set ($14.80), Cheesy Chicken with Sausage Set ($15.80), Spaghetti Bolognaise Set ($12.80), Grilled Sirloin Steak Set ($15.50), Grilled Ribeye Steak Set ($18.00), Sirloin Steak & Chicken, Fish or Sausage Set ($19.00). There are a total of 12 different sets and you could choose your choice of sauce from Black Pepper, Field Mushroom, BBQ, Mango Salsa, Rosemary Onion and Teriyaki. 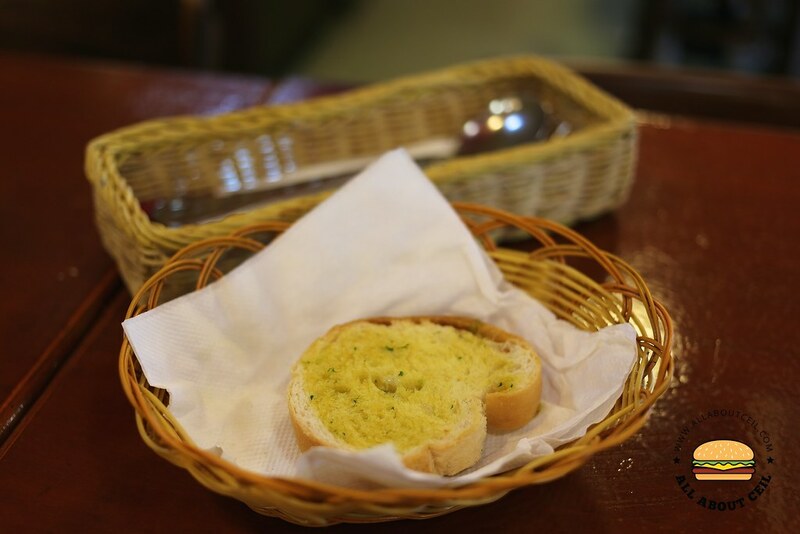 The set includes a Soup of the Day with Garlic Bread, Dessert, Coffee/Tea or Milo. Option is available to change the hot drink to canned drink at an extra $1.00 or change the Dessert to a single scoop of ice cream for 0.80 cents. Most importantly, there is no service charge nor GST added on to those prices. I was there at about 1.30 pm and almost all of the tables in there were occupied. I was asked to seat at a long table for 6 and menu was quickly presented upon seated down. I decided to go with Grilled Chicken Set and requested to change the hot drink to a canned drink. The drink came first, followed by the garlic bread then the soup right after. 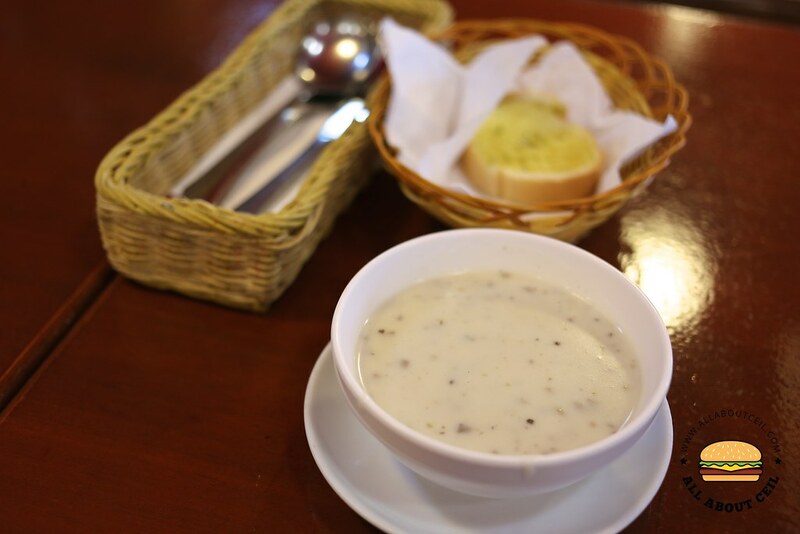 The garlic bread did go well with the Cream of Mushroom though the soup tasted slightly diluted. 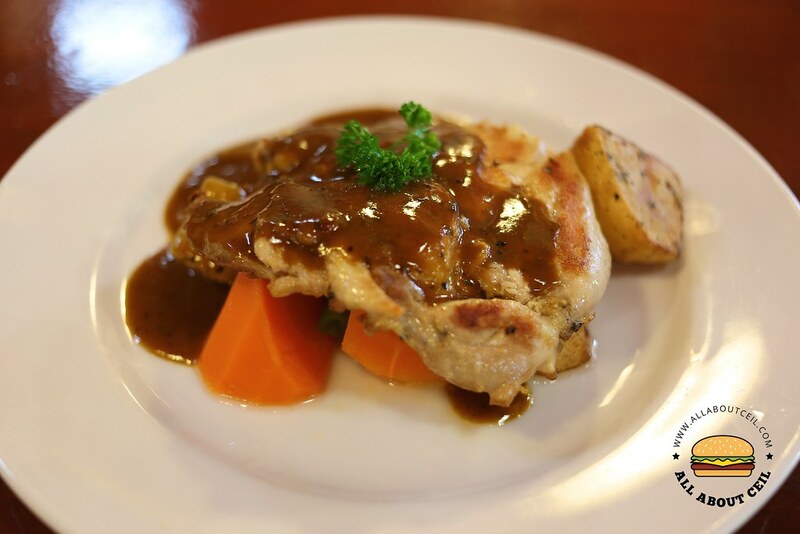 The Grilled Chicken consists of a piece of a nicely charred and flavorful, boneless chicken accompanied by roasted potato and blanched carrot, radish as well as long bean. It is of a pretty good value for a rather comforting taste. 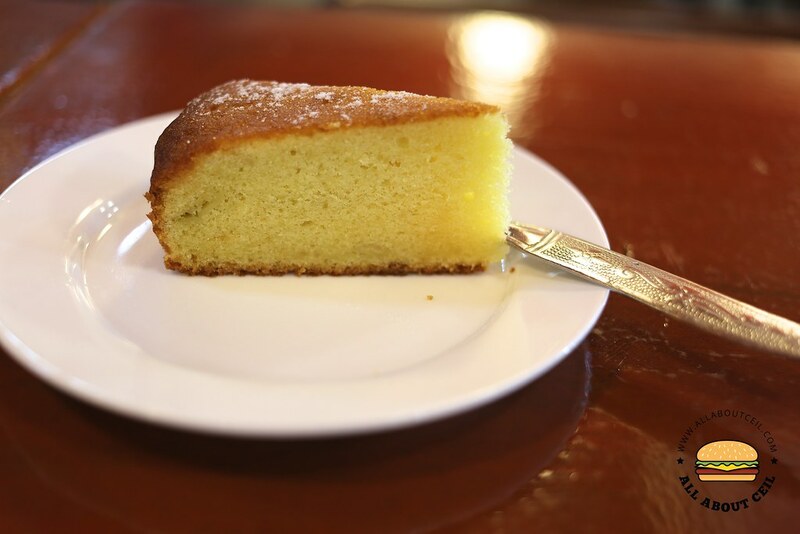 The Dessert of the Day was a piece of buttercake, simple and nice. Their tagline is "A place where you can find quality, services & affordable pricing". And, they have definitely live up to it and has do it right in order to survive so long in the competitive food scene in Singapore. Though the food did not impress too much but their attentive service has definitely left an impression.